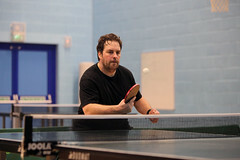 ← IMPROVE YOUR TABLE TENNIS! 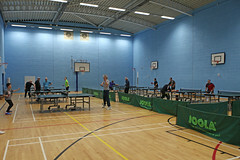 A fortnight of table tennis tournaments concluded with the Grand Finals Night of the Bournemouth and District Annual Individual Championships at the Grange School, Somerford last Friday night. 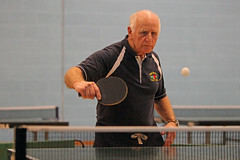 Nine players from the New Milton club were involved in twelve of the fifteen singles finals, and the total haul for New Milton was nine titles, a club record. 14 year old Jack Trafford quite literally got the ball rolling in the first match of the evening to beat last year’s runner-up Matthew Stanfield (Bmth Sports) in the Junior Under 15 final. He went on to beat Krystof Skwarek (Broadstone) in their Bournemouth Handicap semi-final having given Skwarek a 9 start, but found the 14 start he had to give Yaroslav Troshchey (Winton YMCA) a bridge too far in the final. Trafford got off to a good start against Breamore’s Luke Hunt in the Div 2 final by taking the first two sets 12-10, 11-9 but tantalisingly lost the next two 11-13, 11-13. There were some more fantastic exchanges in the decider, with Trafford’s backhand coming to the fore, but Hunt pulled away in the end to take it 11-8. In the Junior Under 18 final Trafford had to take on Bmth Sports’ Ali Malloch who plays two divisions higher in the Premier league. He lost the first two sets 6-11, 13-15 but rallied to take the third 11-9, only to lose the fourth 6-11. The Milton youngster will be disappointed to have missed out on three of his four title bids, but he put in some excellent performances and the experience will have been invaluable. 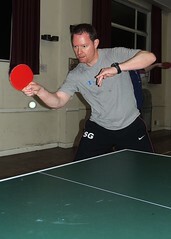 New Milton were already assured of the Div 3 title, it was just a matter of whether it was Steve Cheesman from the F team or Graham Underwood, captain of the G team. The result went with the form book as Cheesman (pictured below), who won the Div 4 title last year, overwhelmed his club mate to win in three straight sets. The Div 4 final saw Ben Greene slog it out with Richard Stroud from the Merton club in a match that seemed to last an eternity. Greene lost the first two sets but hung in there to win the next three to beat his much more experienced opponent. In the Div 5 final, 13 year old Adam Titcombe dropped his first set 8-11 to Michael Kominek (Winton YMCA), but displayed a maturity beyond his years to take the next three sets to claim the title. 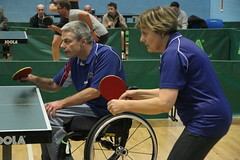 England Veteran Brian Bickell returned to the tournaments after a year’s lay off due to shoulder injury to win both of his Vets finals. 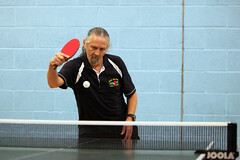 In the Vets 60+ he despatched Dave Nicholls (Ringwood) in three straight sets, and did likewise in the Vets 70+ to last year’s champion Danny Allen (Merton). 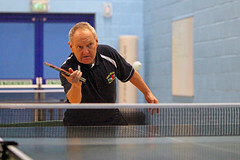 In the Vets 50+ final, Milton club chairman Steve Hemmings (last year’s runner-up) took on former Milton player Alan Gordon who now plays for Bmth Sports. In a very open game, Hemmings’ dogged defence proved the perfect foil for Gordon’s forehand looping as Hemmings won the title in three straight sets. 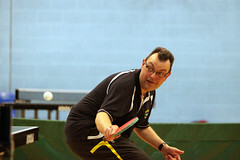 The Div 1 final saw the comeback of the evening as left-hander Andy Tipsana took on Matthew Stanfield from Bmth Sports. The Bourne player went 2-1 up and was leading 10-5 in the fourth when Tipsana came back from the dead to take the set 15-13 after some thrilling exchanges. Now with the wind in his sails, Tipsana left nothing to chance to win the decider 11-7 and then comfort his bewildered opponent. New Milton’s ninth and final title of the evening came in the Vets 40+ final as Gerard Redman took on fellow Div 1 player Ian Brown from the Broadstone club. The game ebbed and flowed and went all the way to five sets. It appeared that Brown had run out of puff and ideas in the decider and Redman (pictured below) won it very comfortably 11-4. Runners-up were Jack Trafford (Junior Under 18, Div 2 & Bmth Handicap) and Graham Underwood (Div 3). The New Milton players will collect their hard earned trophies at the annual Bournemouth and District Presentation Evening on Friday 19th May at the Ocean View Hotel, Bournemouth. Posted on 05/04/2017, in 1. News, 3. Club achievements. Bookmark the permalink. Leave a comment.